What did you hope to achieve in 2013? What do you STILL hope to accomplish in your business before this year is over? How can the last days of 2013 be your best days? I love the parallels between business and sports. As a football fan, I’ve always enjoyed those amazing drives and game-winning plays in the final minutes and seconds of a game… where a team taps into hidden reserves, creativity, and resourcefulness in going for the goal line. If there are things you’d like to accomplish in your business before this year is through, this is the episode for you. I’ll be sharing my proven process for going for the goal line as well as several ideas that you can use in your own business. It’s the 4th quarter, time is winding down. Your coach has called for the game winning play. 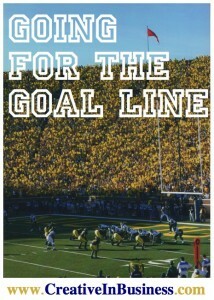 Will you go for the goal line?